This entry was posted in National Newsletter, National Newsletter - 2017 - Issue 2. Bookmark the permalink. The book’s words and illustrations intertwine with your voice. Outside an icy wind blows and the windows rattle. You sing and turn the pages in a mini performance, all eyes and attention on you. The melody is a familiar one to you (the traditional Over in the Meadow), but the words are new. With each page, new verses are revealed for you to sing, as the counting rhyme depicts mothers and their offspring – from walrus calves to arctic hare leverets. The classroom teacher takes a minute to review with you and the class how the worm farm, school garden and everyone’s recycling work helps the planet, even the Arctic, at the very top of the globe. You sing goodbye. Handover is a swift transition. The children stay seated whilst you return to the music room. In this article, I will endeavour to dissect the session you imagined (above) and demonstrate how this 5-minute lesson benefits the class across the curriculum, from cross-curriculum priorities such as sustainability and general capabilities, to the learning areas of English, maths, science, humanities, social sciences and the arts. Forearmed with this knowledge, perhaps you might embark on a similar adventure. The series of books written as variations to the song Over in the Meadow provide a ready-made opportunity to create a singing book experience. I am using Over in the Arctic as the example here. Seeking and gaining permission to conduct the last 5 minutes of your music lesson in the classroom has opened a dialogue with the classroom teacher and let you into his/her space – a great start to ongoing collaboration. In the imagined session, a short Q & A at the end of the song, is related directly to a part of the curriculum. Deliberately choosing a book from the series that matches the weather makes the return to class, in this scenario, a learning experience. During that walk in the cold fresh air, everyone got to feel the temperature change, experience a cold nose and ear, the tingle of wind disturbing the hairs on the skin and the relief on reaching a warm, safe place. They look at the book, hear what is sung, imagine the cold based on recent experience and understand the comfort of being curled up on the frosty floor with a mother arctic fox because they are warm on the carpet with you! Singing a book has created a rich experience that a very diverse range of students can appreciate, regardless of ‘age, stage or capacity’. By sitting everyone together as your audience, you have shaped a shared experience. I believe this creates a sense of wellbeing, cohesiveness and being ‘up to the challenge’. It also allows for the serendipity of students reaching beyond expectations within their own minds and imaginations. Over in the Arctic and its counterparts are great texts to draw upon. Whilst the text is being sung students are hearing verbs, their conjugations and declensions: Hide, we hide, they hid, paddle, paddling. There are descriptive words by the handful, passages of dialogue and complexly constructed sentences. Pre-readers can hear the rhythm of the text, grow their understanding of print’s relationship to phonics, identify start and finishing sounds and use the illustrations as predictors of the coming verses. More advanced listeners will hear and recognise rhyme and metre from the phrasing of the sung rendition and appreciate the richness of the language. New vocabulary is presented in context alongside adverbs and alliteration such as ‘When wolverines growl and grumble.’ In this context, does grumble mean complain or something else? Singing Over in the Arctic opens the door for the classroom teacher: Where is the arctic? Why do the snow geese in the story migrate? What does migrate mean? Why didn’t the sun shine on the wolverines? Why is it dark for a long time in the Arctic? Why is it cold there? Scenery flats in an opera performance benefit the listener – singing a picture book offers a similar benefit. The science of animal adaption and specialisation is depicted pictorially. There are many visual clues to be noticed. 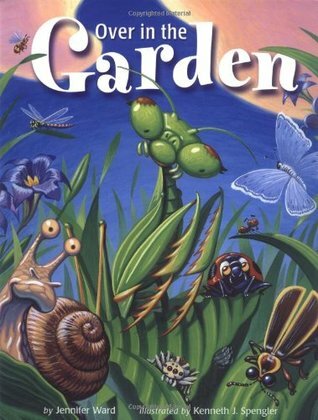 Indeed, singing this book as part of Earth Day or World Wildlife Day could appropriately occur in the science room. There are opportunities for using this singing story as inspiration in drama and visual art contexts, technology, multimedia projects, as a database for simple research projects or maths and number activities. Critical thinking and reproduction equations could all be related back to most of the picture books in this series. Sung texts can enrich the child’s experience, be a catalyst for research and provide new insight. Music can echo in a child’s head while they research, analyse, reflect and report. There is enormous potential for beginning with 32 pages of picture book, creating interest and excitement with a singing experience and motivating hours of curriculum relevant activity. You could be the catalyst, the collaborator or the inspiration. Music across the curriculum could be a reality for your school. 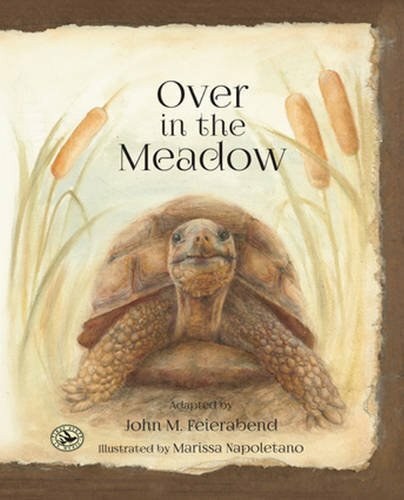 The traditional song: Over in the Meadow has spawned a range of books based on specific ecologies. 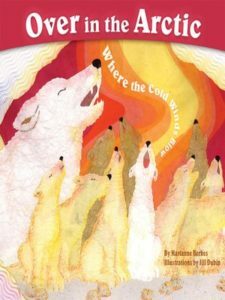 These picture books use adapted lyrics with 21st century examples from across the globe: From Over in the Arctic and Over in the Desert, which follow the original song lyric formula, to adaptions such as Over in the Wetlands (A Hurricane-on-the Bayou Story). The 21 natural-world titles often include information about the animals and the environment upon which they are based. Several have suggested lesson plans. An additional 15 books illustrate the original rhyme, Over in the Meadow or variations on that theme. Jill McDonald’s 2012 version is very popular and the illustrator Ezra Jack Keats’ version has been reprinted many times. Several fictional versions use the same song: Three celebrating Halloween, another about dance and performance. Two construction theme versions include a wonderful house building count backward version. One celebrates twins, called Who’s Who. There is also a fairy-tale style version called Over in the Castle. A further handful of titles are perfect for child-carers, playgroups or three year old/early childhood staff to sing. Before nap time, try Around the Neighborhood: A Counting Lullaby (uses USA spelling but is designed for toddlers) or Bedtime in the Jungle. 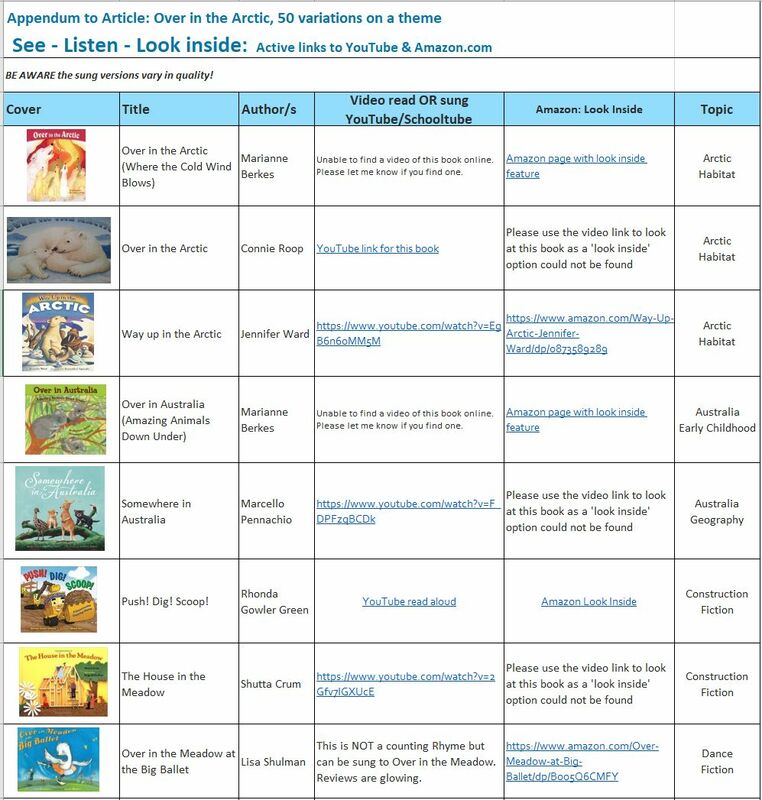 Sing anytime titles, Over in the Grasslands (the one by Anna Wilson), Over on the Farm and Over in Australia (the one by Marianne Berkes) also suit this age group. Marianne Berkes has added to her collection of titles with a Meadow book that celebrates the solar system called Going Around the Sun: Some Planetary Fun. I am discovering new titles all the time and would love to hear if you know of one I have missed. You may already have these books in the school library, some are available via your council library system, all of them can be purchased and many have kindle versions costing as little as $1.09! Take the opportunity to collaborate with the school librarian – potentially you could run a “Singable Book” session in the library for Book Week or Science Week while the busy librarian sources books from my printable list. She/he may also know of other titles in the library with singable potential. I have created hyperlinks so you can watch a YouTube video or use the Amazon ‘look inside the book’ feature to assess suitability. Active links to the TROVE library catalogue give you a 24/7 search opportunity and the ability for titles to be brought to your local library for you to peruse. 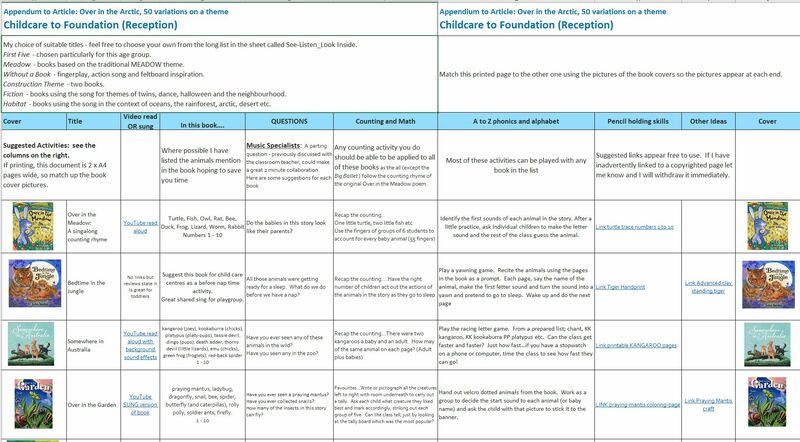 There are pages using ACARA Australian Curriculum criteria with suggested activities for each school year level Years 1 – 4 plus a Childcare to Foundation (Reception) sheet with 26 titles and activities for consideration. I don’t need to explain all the benefits of singing to a Kodály audience or the ways in which music works with the brain to benefit the performer and listener. By bringing this activity out of the music room and into all the other places of learning in your school, I believe your colleagues will gain a greater appreciation of you as a professional educator and music as an invaluable learning tool across every part of the curriculum. Note the Year Levels information in the Addendum to this article. Online TROVE and State by State library websites are listed in the accompanying Addendum. This list appears on the Addendum page titled ‘Librarian’. TROVE is a collaboration between the National Library, Australia’s State and Territory libraries and hundreds of cultural and research institutions around Australia, working together to create a legacy of Australia’s knowledge – searchable online.